Japanese work days start early – very early. By 7:15 usually all the trucks have left the company and are on the way to the genba (現場 – another word that is not easily translated – it means scene, site, the place where stuff happens – in other terms: construction site for gardens). I arrived at 8 and missed Oyakata (親方 – the master), but his wife welcomed me and begged me in for tea. After introducing myself and answering questions about my life, I was told that one of the company’s employees would pick me up around noon. Oyakata’s wife recommended that I visit the nearby Toji-in. I had been to this garden before, and it is one of the gardens that have a special place in my heart. I took one of my favorite shots there, which became the title image of my first PechaKucha presentation in 2012. 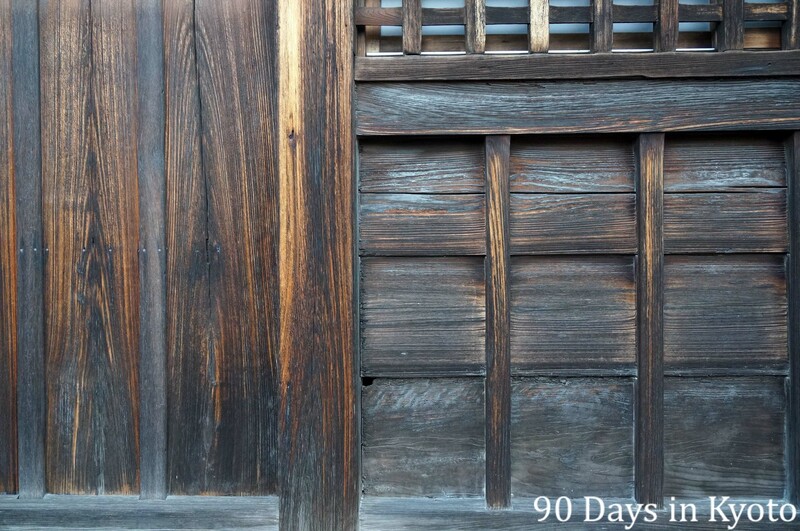 I will write more about Toji-in later, but wanted to share this one picture of the temple’s wooden structure with you. It probably is the wooden structure of aged cedar that made me fall in love with Japanese architecture and gardens. And I remember taking this picture and thinking: I am happy to be back.